It’s a fact of life in the digital age. As our smart phones, laptops, printers and other electronic devices reach the end of usefulness, we need a place for disposal. If you are a friend of the environment, you should realize one of the worst places to throw out so called e-waste is in the trash. On the Syracuse University campus, there are now two locations for e-waste disposal, run through the SU Sustainability Division’s recycling program. Last spring, a collection bin for e-waste was established at Bird Library on the ground floor near the restrooms. Now, a second collection spot is available in the Carnegie Library. Cell phone and laptop batteries are among the items accepted for disposal. But it doesn’t end there. Broken digital cameras and camcorders, old video games, inkjet cartridges, external hard drives, even memory keys can be dropped in the bins. 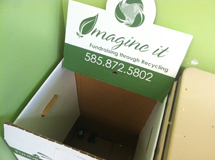 The items collected will be picked up by a Rochester-based company called Imagine It, which recycles old electronic goods. A full list of e-waste items can be found here. For working items that are still useable, the Sustainability Division suggests students sell or donate them, such as donating cell phones to the Advocacy Center on campus. E-waste can create an environmental hazard, and despite a public information campaign locally, roughly 10 percent of all e-waste still winds up in landfills. Companies like Imagine It help dismantle the items, recycle the useful portion and properly dispose of the portion that could prove harmful to humans and animals. For more information on sustainability projects on campus, click here.